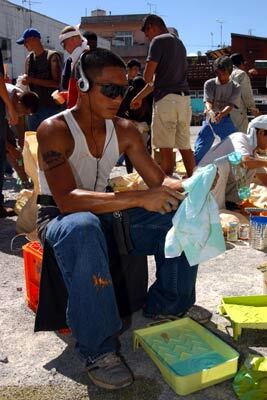 NAGO, OKINAWA, Japan — Wiping sweat off his brow, a Marine pours thick, orange paint from a one-gallon bucket for a local resident to use. Exchanging a few mutual words, they smile and continue to work in the sweltering Okinawa heat. This was the scene when twenty-nine service members from Camp Schwab volunteered to help local residents paint various buildings, improving the curbside-appeal of their community here July 18. Service members from Camp Schwab were requested to volunteer for this task with only two days notice. However, the outcome was greater than expected, explained Staff Sgt. Marvin E. Hernandez-Garcia, embarkation and combat service support specialist with 3rd Reconnaissance Battalion, 3rd Marine Division. 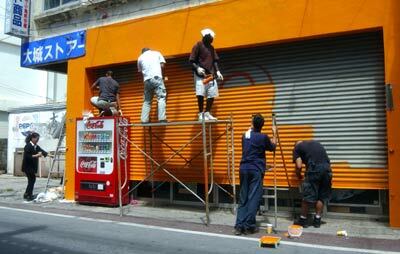 This is the first time Marines and sailors have helped paint this area, according to Ogido. 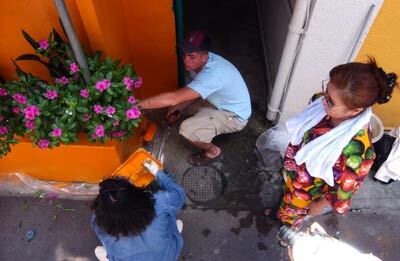 The Nago City Social Business Establishment Association provided the necessary equipment to complete the project. The service members and more than 150 local residents were prepared for the day-long project with scaffolds, ladders, tarps and about 100 buckets of paint. After receiving maps, service members and Okinawans combined into groups of six and seven, walked to their designated buildings marked with spray painted numbers and painted them with the corresponding colors of either orange, pink, red or blue. The residents provided lunch to show their appreciation for the hard work the service members completed. After nearly seven hours of painting, the project ended with a closing ceremony, which included remarks from residents as well as service members. Concluding a hard-day’s work, the mayor of Nago City, Tateo Kishimoto spoke to everyone who helped in the project.